Hmmm. The question doesnâ€™t really work because Iâ€™d need to have a garage first, and then get something worth garaging. Certainly a Ferrari, any of the many on display in Newport, would be nice. So would one of the museum-quality Duesenbergs or the Bugatti. But those deserve even better accommodations, something along the lines of climate-controlled secure storage. These vehicles are worth more than my house â€“ thus they donâ€™t belong with me. The â€˜70 240Z still looks contemporary, and weâ€™d have loved to be able to pull todayâ€™s test car â€“ a 2009 Nissan 370Z Touring edition â€“ alongside to show how the direct descendant takes its styling cues from the original, including its overall shape, its big rear window and hatchback and the vertical door handles. Our tester was the â€œTouringâ€� model, which adds four-way power adjustable heated seats, Bose sound system with auxiliary plug and XM and Bluetooth. Our Z started with an MSRP of $34,460, added the sport package for $3,000 plus lighted kick plates (doorsills) for $200 and carpeting throughout ($210). With destination, it topped out at $38,810. That puts it in the Audi TT category, though you can certainly shop it against the new Mustangs and Camaros or the BMW 1 and 3 series. Another to look at is the new Hyundai Genesis Coupe. Also available in the 370Z is a navigation system ($1,850.) Weâ€™d have liked to try it. Instead we had a nice leather-covered, lined storage box that may have been more useful most days than the nav system. The only drawback was that the engineers didnâ€™t let the lid open quite high enough. Still it was a great repository for cell phones, transponders, MP3 players, and sunglasses. The other major storage area is in the center console. It has a removable shelf and a power outlet inside. It also has a drawback. The latch is right where I rest my right (shifting) elbow. As a result, I opened the console top every couple of trips through the gears. While weâ€™re dwelling on the negatives, and there werenâ€™t many, add in road noise. 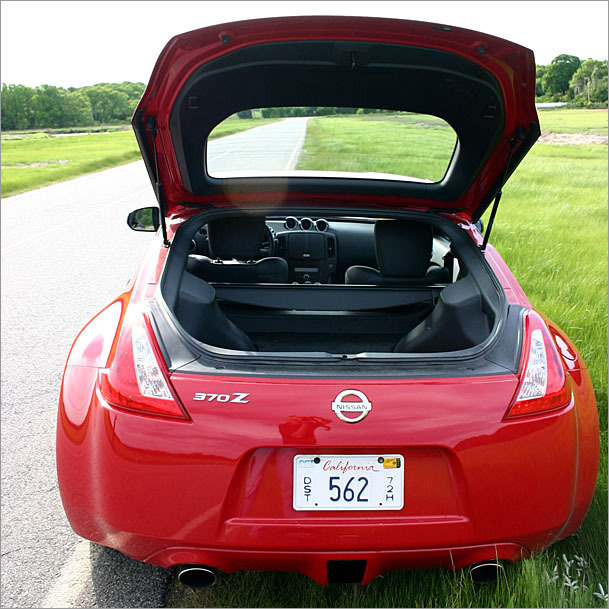 Nissan cut 95 pounds from the curb weight as compared to the previous Zs. Part of that must have been in insulation because there was enough road noise that Mrs. G had trouble hearing on her cell phone while at highway speed. Trust me, she easily made herself heard about that once weâ€™d stopped. OK, so now that weâ€™ve piled up some â€œcons,â€� be advised that the pros include the engine, handling, â€œwowâ€� factor, and much-improved interior. Outside visibility started out as a problem. However, judicious seat and mirror adjusting took care of any claustrophobic feelings as well as most of the blind spots, though backing up in parking lots requires lots of head-swiveling. Likewise, it took a few times on the road before we really got used to the handling. After that, a fun game became gradually speeding up on curving country roads until persistent tailgaters got the message and backed off. The 3.7-liter V-6 puts out 332 horsepower and 270 lb-feet of torque. When it got cranked up, the exhaust note was quite nice. 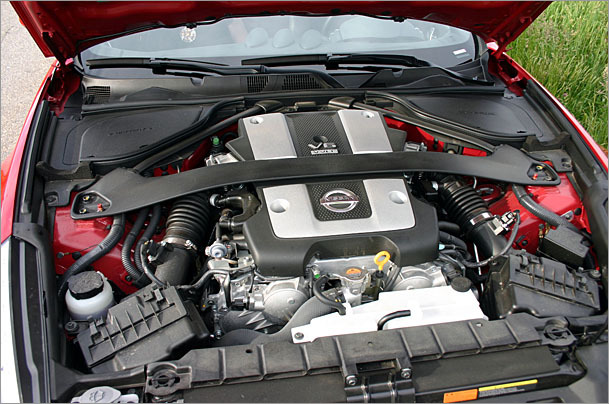 Nissan has mated it to either a 7-speed automatic or 6-speed manual transmission. Theyâ€™ve also programmed the computer to rev-match engine and transmission on any downshifts â€“ in effect â€œblippingâ€� the throttle for you. Gone from the previous Z is the visible cross member in the cargo area. That gives the rear cargo space a roomy look that allows a couple â€“ after all, it is a two-seater â€“ to bring just enough luggage and â€œadditionalsâ€� for a weekend away. The combination fuel and engine temperature gauge has parallel lines that go from E-to-F or C-to-H as a row of orange LED lights. The theme of orange interior lights is consistent throughout the instrument panel and all controls. 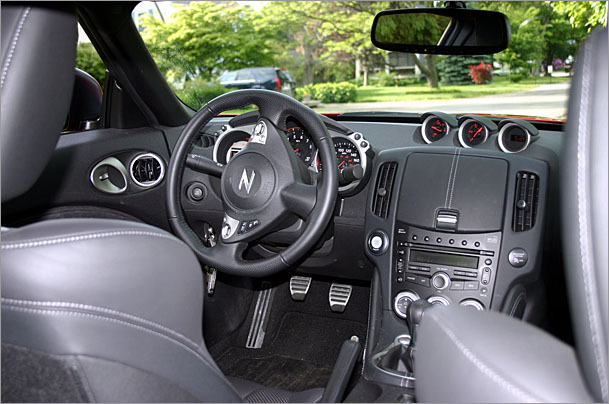 The nice Z design of having the speedometer, tachometer and associated information areas move up and down with the adjustable wheel so the driver always has a clear view of that information through the top half of the (very comfortable to grip) steering wheel. Another Z tradition remains with the oil temperature, voltmeter, and clock in a three-pod cluster at the top center of the dashboard. More from that "lights-done-right" department. The vanity mirror lights were nicely diffused; the xenon headlights gave a nice rectangular lighting pattern, and the illuminated "Z" on the doorsill reminded you that you were driving something special. One of the problems in vehicles with so-called smart keys and on/off/start buttons is "Where do you put the smart key?" Nissan has provided a slot in the lower left side of the dash for the smart key to be safely stowed. Getting back to Mrs. Gâ€™s question: Which car? I was quite happy to be driving home in the 370Z â€“ just enough of the retro and plenty of todayâ€™s upgrades. Only a cursory graf on the rev-match shifting, which eliminates the need to heel-toe shift? That's an awesome feature that wouldn't really show its full value unless the car was driven at speed. You need to get that baby to a track for some hot lapping to really put it through its paces. It is a GREAT looking car, and I hope they see this, or feedback that I post to their site. I saw one, in black, in person and it is a very nice look. I still prefer electric, but the designer designs cars, the company makes them. I already told my wife, when I hit mid-life, I'm growing a ponytail, getting a big steel texas-style buckle for my tight-skinny jeans and getting a 370Z with the words on the hood that reads "1 wife, 3 kids, 2 mortgages, no money, and a pile of bills but hot"
Astounding. You were given a Z to review. It's a sports car. Drive it hard. Give us numbers. Descibe the performance. Give us action pictures. Nobody cares about your trip to R.I., your wife's cellphone call, or nice touches. In the future, stick to reviewing minivans. For almost $40k, you could simply buy an G37 from Nissan's luxury brand and get a lot more upscale touches and fine details. Don't Zs come with a free BowFlex? Yeah, a real chick magnet! That rev matching feature sounds fantastic. 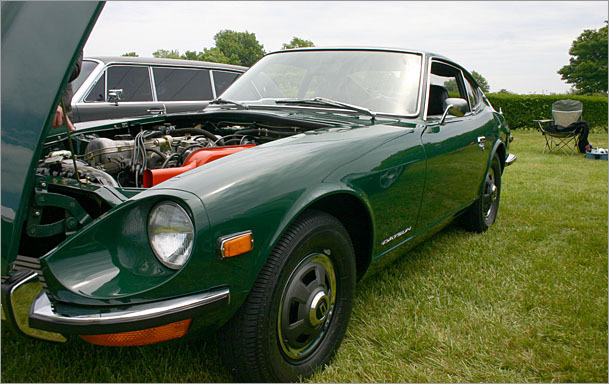 I had a '73 240Z 35+ years ago and it was like riding in a buckboard. Who'd want that old piece of crap compared to today's Z? The 240Z had a manual choke. I'd have to scream at the thing to start while yanking on it fully with my left hand while cranking the key with my right hand until the engine engaged. And we bought it new. Keep your old piece of crap called nostalgia. I'll take the new cars of today every day of the week. How many Zs in Puzzie!? I use to date a guy who drove a Z. Yeah, he was compensating for something. We broke up. He needed to do better than a Z. 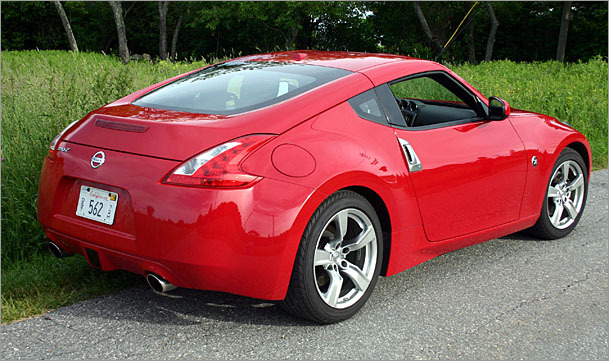 The new 370Z looks more exotic than the previous 350Z model. It takes a good 6 months of looking at the car to finaly brake down and stop calling it ugly. The lines and shapes are starting to make sense like one of theMagic Eye pictures. Most people think the Z-model has a type of buyer but you'd be wrong. It can range from cocky rich kid to a mild mannered aunt. But I would still love to get my hands on a gently used, factory stock 300Z. They looked like miniature Lambos. When the 350Z rolled in, I didn't like it one bit. Too toyish and didn't give off the sense of "top of the line" sports car model. As a recent member of the Newport Historical Society I'm a little put off that I didn't get an e-mail about this event. I love cars and would have loved to view the classics. Andy, ur an idiot for not likin the 350z. Go get your 300zx pos and lets see if you can keep up in any manner of performance. That car can turn for crap, too heavy with too much roll. 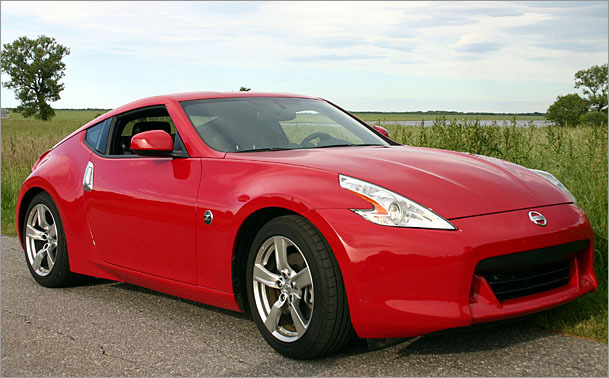 That car was not even close to the way the 350z was redesigned. The main focus was to get the car to turn and stop on a dime, just as my Track model does with ease. My brembo are like magic, never felt stopping power like it. If you think the 350 was too toyish, why dont you do some research and see why it has one so many events WORLDWIDE, especially in the U.S. and Japan. Cant recall the 300zx coming anywhere close to what the 350 has accomplished in only 6 years. FYI theres a local dealer by my house that has a 96 for $2500. Hmm i wonder why its so cheap if it looks like a lambo, hahahahahahaaha!